I recently read Boys in the Boat, and I highly recommend it. 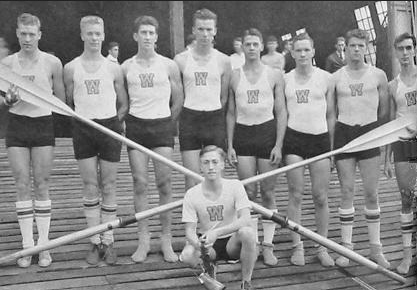 The book chronicles a group of working-class men who learn how to row, compete for the University of Washington, and eventually, represent the USA at the 1936 Olympics in Nazi Germany. If you liked Unbroken and Seabiscuit, I think you’ll really like this book. The author does a great job of chronicling why someone would undergo self-torture to compete in a crew race. This is another David vs. Goliath type of story, which I tend to like. One of my college roommates was on the Yale heavyweight crew. He used to get up every day at dawn to train with his team. He used to talk about how painful crew was, how you were pushed to the max physically and mentally. I really like how the book chronicles how rowing was such a preppy, WASP-y, and east coast sport, dominated by wealthy students at Harvard and Yale. So, I found it really cool how some very poor boys from the west coast came out of nowhere to shake up the sport. The book also chronicles at the same time what was going on in Nazi Germany and how Hitler used the Olympics to “market” Germany to the outside world. Overt anti-Semitism was halted, all the streets were cleaned up, and everyday citizens were given detailed instructions about how to behave in front of foreigners during the Olympic Games. They were to smile, be friendly, and duck any questions about anti-Semitism. Unfortunately, he succeeded. Some in the press began to write about how Nazi anti-Semitism was exaggerated, that the German system created incredible economic growth, and that Hitler was a strong leader from whom other nations could learn. Unfortunately, this type of argument (economic development is more important than human rights) is still heard today, to justify the apartheid era in South Africa, Chile under Pinochet, the Suharto years in Indonesia, etc. It is amazing how “normal” evil can look when we want it to be.